Windows 10 is here, and if you're a fan of its Solitaire, you might need to shell out some cash depending on how much you enjoy the experience. Microsoft has released Windows 10 today, and with its release, we’re slowly learning about everything the new OS has to offer. While there are a number of great features included, we’re surprised to see a new version of Windows’ iconic Solitaire made its way to Windows 10. What’s more surprising is it appears Solitaire has been turned into a freemium game. 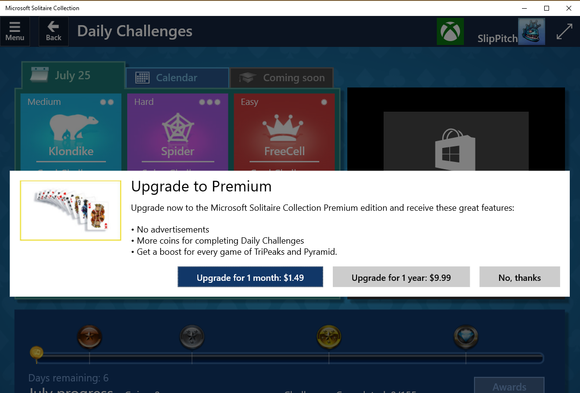 As you can see from the image above, Microsoft offers a premium for its Solitaire game. The premium, which can be purchased in 1-month and 1-year bundles, allows players to play Solitaire with no advertisements, gain more coins when completing Daily Challenges, and get a boost for each game of TriPeaks and Pyramid played. Solitaire has been a staple of the Windows experience for as long as we can remember. Turning it into a freemium game seems like an underhanded way for Microsoft to make a quick buck on such a simple game. If you’re a fan of Solitaire, you might want to consider purchasing a pack of physical cards and play the game offline. At least you can do something else besides play Solitaire with your deck of cards, like perform magic tricks, build a house of cards, or play 52 card pickup. It has been since Windows 8. Was it not just free in Win8? At least that was my understanding (I don't know for sure as I skipped Win8). Now with Win10 you get a version riddled with ads and you have to pay to get rid of them. It still is free. Yes there were/are ads in the Windows 8 version as in just about all of the Microsoft games on the Windows Store and you can pay a few bucks to remove them. A few dollars per year. This is Microsofts new business model, reduce the price of the OS, or give it away for free, then charge a little bit each year for everything. It was always like this in Windows 8. Meh. Who cares, it's just solitaire. Neither does Perez but in his ignorance he thought he had found something special to write an article about. I do hope he does at least a little investigation into whatever he decides to write about next or he will keep dragging down the average quality of this website. How does a writers ignorance turn into an article on this site?